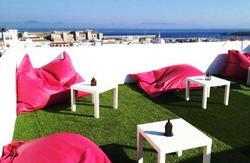 Pink House Tarifa, is a lordly Andalusian house, made out of pink and blue roller, that dates back to de 18th century. Thanks to its privileged emplacement, this hostel offers an spectacular panoramic of Marocco, where the Mediterranean Sea and the Atlantic Ocean come together. This hostel that long ago lodged so illustrious guests as Sir. Winston Churchill, has been converted into a lodging, only suitable for those who look for exciting experiences. 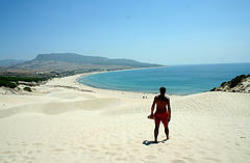 It has been designed for people who can enjoy the singularities of this natural environment, and specially for non-conformist travelers who look for an at-temporal place, so they can enjoy the wonder of the sea and the secret captivation of our neighbor Morocco. 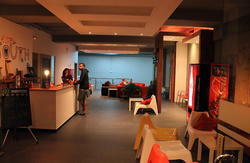 Pink House Hostel is located 5 minutes distance walking to the beach, and in the heart of the old town of Tarifa. Very close to the bus station and in the main Street, full of shps, commerce, restaurants and Banks.